Chinese writing looks very peculiar to the eyes of people who do not write characters. Each character represents a whole syllable. Each single syllable can be a whole word, for instance 四 (sì) meaning four. Or it can be part of a word, for instance 第四 (dì sì) meaning fourth, since 第 indicates ordinal number. Chinese characters appeared in the Bronze age as rudimentary writing on bones (see Introduction), and therefore constitute a tremendously old legacy, and an amazing example of humanity's creative thought. At first, each character resembled very well what it meant. This is called a pictograph. A fish character looked like a fish. With time, the characters evolved and at present, very few characters are pictographs. Instead, they developed special "shapes" or "patterns" that repeat consistently, giving birth to character families, radicals, pronunciation cues, etc. The following table shows the evolution of the character 马.
Chinese language has a set of initial and final sounds, and tones (see Pronunciation). They combine to yield a finite set of possible syllables. There are fewer syllables than words or ideas to express, so some words are pronounced in exactly the same way. But the characters that represent them are different. Each character gives much information on meaning, in order to distinguish them from another word that has a similar pronunciation. The characters became logographs, representation of words or morphemes1. Roman letters are phonographs, one letter represents a sound. In the figure above, the oracle bone character is a pictograph of a horse. In the traditional variant, you can almost see a horse there, with the four legs and tail. In the simplified variant it is possible to see the horse only looking at the evolution, it is a logograph (sometimes called ideograph). The last character has the "horse" radical, and a particle 户 to indicate the pronunciation. This is true because 户 is derived from the traditional form 盧, a surname pronounced lú! Chinese dictionaries are arranged by radicals. You look for a radical, which are few, and then you can see all the characters that have it. Each character has to be written with strokes. 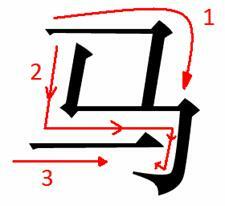 In Chinese there are also a limited number of strokes, which are always written in the same direction. Vertical strokes are written in the "top-bottom" direction and horizontal ones from "left to right". The first strokes to write are the ones on the top left and move downwards. Following this simple rules, characters are easier to write. In the 1950's decade, the Chinese government introduced the last modification to the traditional set of characters to increase simplicity and literacy. The new set is the simplified set, used in the PRC today. In Hong Kong, Guangdong province, Taiwan, and Macau they still use the traditional ones. Simplification was achieved by following some rules, like suppressing or changing complicated parts, replacing dots with a line, or creating some new radicals, etc. 風 → 风 fēng, wind (this is the character in "feng shui"). 學 → 学 xué, study. 請 → 请 qǐng, please. 什麼 → 什么 shénme, what? Characters are beautiful creations that strike as complex and difficult at first, but they are simpler than they seem. 1. Morpheme: smallest unit of a language that has meaning.